Monticello was established in 1827 and was founded to be the county seat of Jefferson County. During the depression of the 1930s, many of the residents of Monticello could not afford to build new homes and the houses were renovated or restored. 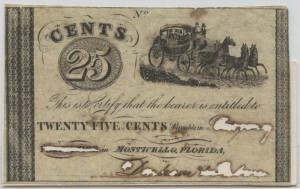 1837-1840 25 Cent Note Signed by (Wm.) Denham & (Joseph) Palmer partners with Darius Williams 1838-1850. 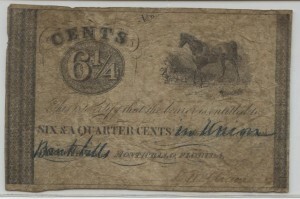 1862 note for $1,442.29 from Monticello, FL. Promise to pay Denham & Palmer or bearer. 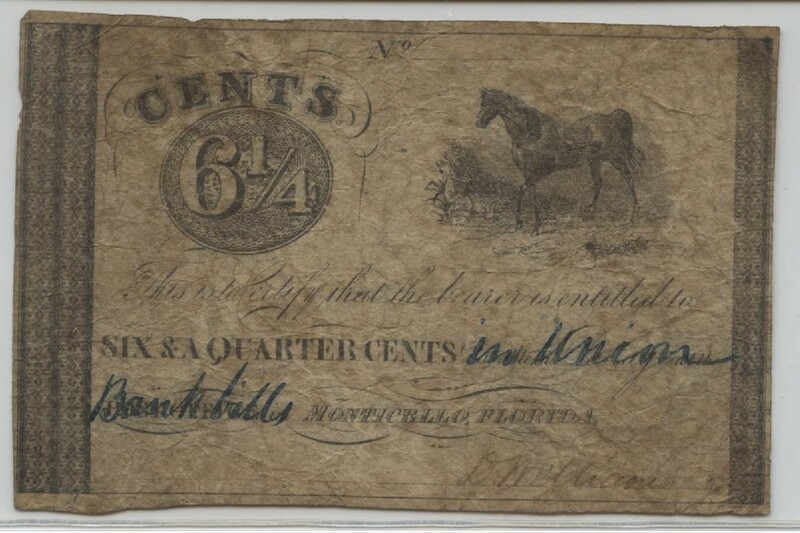 D. Williams, a wealthy cotton buyer who’s notes were payable in postage at the post office. Although the notes are not dated they are believed to be circulated sometime between 1837 to 1840.